What’s Next for Imagery Insights Providers? https://sheisfiercehq.com/shop/ buy now As the U.S. commercial remote sensing (CRS) industry continues to evolve, there is a secondary, related industry emerging alongside the traditional imagery data providers; we refer to this as the imagery insights industry. A cluster of young companies, such as Orbital Insight, Descartes Labs, SpaceKnow, OGSystems, Ursa Space Systems, TellusLabs, and others, is experimenting with new business models that create insights derived from remotely sensed imagery data. buy now Consistent with broader analytic-and service-oriented trends in the market, these companies are selling information derived analytically from pixels, instead of simply selling those pixels. This shift from data to analysis is revolutionizing the CRS industry and allowing firms to provide advanced, tailored analysis to customers across a wide range of commercial sectors and industries. Further, this increasingly customizable analysis in support of real-time decision-making is a growing segment of an even larger field called Geospatial Analytics-as-a-Service (GaaS, or sometimes called AaaS). http://www.santacruzpumas.org/research/ buy now There is considerable overlap between the two industry segments. If any distinction exists between the imagery insights industry and the broader GaaS industry, it is the extent to which the former emphasizes imagery data as the foundation of analysis, versus companies in GaaS, which predominantly leverage other sources like social media and traffic camera data as the core of their analysis. The imagery insights industry owes its inception to the recent abundance of cheap, easily accessible, and readily disseminated remote sensing data from both satellites and aerial platforms. In addition, the adoption of cloud computing provides these companies with a platform in which to quickly develop, test, and offer new, machine- and expert-based analytic applications to customers. In this article, the term Geospatial Analytics-as-a-Service (GaaS) is used to specify an Analytics-as-a-Service (AaaS) model where the primary or majority of data is geospatial. This term, and several variations including Imagery-as-a-Service (IaaS), has been used in a number of publications including the 2017 USGIF “State of GEOINT Report” to refer to similar concepts. The terms have subtle differences and are evolving over time. click here Companies operating within this sphere rely on proprietary software and algorithms to create tailored analytic products. Advances in big data collection, storage, and query allow imagery insight providers to comb through massive amounts of sensed data in minutes or hours instead of weeks. Technologies such as machine learning and artificial intelligence (AI) can rapidly identify relevant data points and non-obvious connections and turn them into actionable intelligence. Data source and platform agnosticism gives GaaS providers considerable business latitude, and allows them to target specific industries by creating tailored, customer-specific insights. While value is often described in the context of precise, high-speed, current information, companies are also assessing the added value of historical data, for time-series reviews, change detection, and trend analysis. Large amounts of sensed data are amassed in company archives, and are now increasingly placed into the the cloud for ease of collaboration and experimentation, in platform such as AWS (Amazon Web Services) Earth. The addition of temporal aspects creates a powerful new dimension that potentially drives wholly new value to customers,whether traditional national security customers or any of a wide range of emerging commercial customers for whom speed is an essential aspect of competition or market value. While the opportunities are many, choosing the right combination of sensors, analytics, business models, and markets – in essence, the insights value chain – has and will be the key discriminator of success or failure in the market. Generally, governments – especially their national security sectors – prefer to purchase data and conduct their own analysis. But the shift in market size and growth for both the remote sensing data and insights markets has been underway for a while. 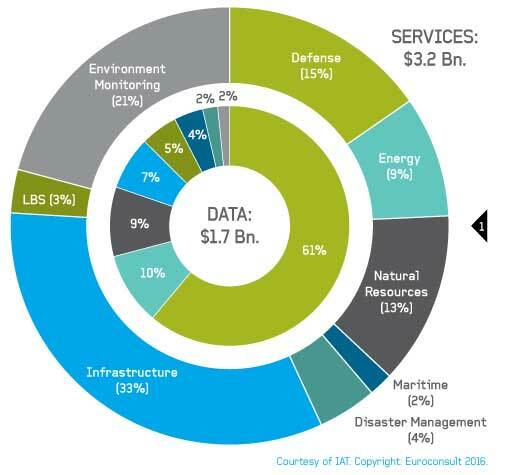 Euroconsult assessed that the global value of remote sensing analytic services surpassed data sales in the past few years; while both segments are growing, the services sector growth continues at an explosive rate, and is expected to continue to grow quickly. The combination of rapid revisit, large-scale data management, and advanced analytics offers tremendous potential, both commercially, and to inform key government policies. See buy now Figure 1. Less understood is the tectonic shift emerging in the artificial intelligence world. Estimates of artificial intelligence firms globally range from 1000-3500, with heavy concentrations in the U.S. and Europe. Dramatic change and disruption is bound to happen in such an ecosystem, given the sheer amount and diversity of investment. Aside from purely commercial activities, governments are also placing increased investment in the connection between geospatial intelligence and AI, such as NGA’s public-private partnership initiative, the U.K.’s early 2017 announcement of plans to invest in AI development, and France’s “AI France” plan designed to establish leadership in the industry. Other countries are beginning to awaken to the opportunity to benefit from the geospatial-AI link. Traditional national security users are highly savvy about remote sensing, and a growing set of new commercial customers is increasingly knowledgeable. In order to be successful, however, imagery insights firms will need to understand different nuances of addressable markets, and how they are changing. They will also need to understand the comparative value of what they are providing relative to complements and substitutes in the market. This involves understanding the unique needs of customers, the value of information to them, and especially the price sensitivities to other sources in the market. While some customer knowledge is still necessary, however, a true commercial market will emerge only when the need to understand remote sensing is a mere artifact, just as the cell phone user cares little about the fact that their call home transits terrestrial, undersea and space channels. Trust will also be important. Both government and commercial users potentially benefit from full engagement with the remote sensing industry. Let’s start with government. The U.S. government has been leveraging commercial imagery data for over a decade, and it continues to increase its commercial data consumption. The National Geospatial-Intelligence Agency (NGA), for example, pioneered the NextView and EnhancedView contracts since the advent of U.S. commercial imagery; more recently, NGA awarded a $14 million contract to Planet for commercial imagery data over 25 select areas of the globe. NGA’s Commercial Initiative to Buy Operationally Responsive GEOINT (CIBORG), with the support of the General Services Administration (GSA), is further designed to enable a steady flow of commercial, unclassified data and products into the Intelligence Community (IC). Similarly, unconventional is the U.S. government’s interest in increasingly automated analytic products: DoD’s Algorithmic Warfare Cross-Functional Team (Project Maven) is working in concert with NGA to incorporate machine learning and AI much deeper into combat and other operations. While Project Maven is beginning to work with commercial analytics providers, the majority of other U.S. government activities have been focused on acquisition of data. The GaaS providers have not yet found a substantial role in satisfying government analytic needs. Why? First of all, some of them may not be emphasizing government needs as a matter of business strategy. Within government, however, some impediments exist as functions traditionally done inside the government, based on new business approaches and technology, emerge in the commercial world. The answer may also have to do with additional misperceptions or mistrust of the analytic processes used to derive imagery insights. Imagery analysis traditionally done as a high-end, artisanal process now moves to the cloud, at speed and scale. Uncertainty abounds, and change is hard. The U.S. government’s national security and public safety missions leave little room for error. Commercial customers also have unique needs, especially in fast-paced areas like transportation or slower functions like insurance or mining. What are the addressable markets here? These potentially include, but are not restricted to, sectors like agriculture, insurance, mining, oil and gas, global asset management, and others. Accuracy and accuracy-at-speed will be important for assessing trends, and risk, and other factors around which those customers create their own business value for individuals or other companies. If customers are going to value and use commercially- driven insights, they are going to understand and have con- fidence in how the process is done. Increasingly, the imag- ery insights companies are moving beyond using software simply as an analytic tool to view and decipher imagery. Software allows preliminary analysis beyond the labelling of sensed objects, recognizing trend lines through historical and current data, and even beyond short-term predictions. Sophisticated functions like mapping, discovery, change detection, 3D analysis, and others are now possible. However, high-value, advanced analysis provides an understanding that goes beyond the “what,” “where,” and “how,” and sometimes adds the “why,” and the “so what.” It provides an in-depth assessment of an issue, and often includes a level of forecasting stretching beyond the immediate future. The AI software and machine learning algorithms used by the imagery insights industry have not yet achieved this more advanced level of analysis, except in narrowly defined areas. However, rapid advances can be expected given the intensity of effort, both within this industry but also because of the broader base of AI development. But this will be insufficient unless the analytic tradecraft underlying the analysis is explicit, whether to government analyst or commercial consumer. What aspects of tradecraft might they need to know? Let’s look again at the government and commercial market segments. A vision of commercial success for the imagery insights industry with U.S. government clients would involve seamless incorporation of commercial insights into government analytic products. That will require that the analyst understand the provenance and quality of the data, the tradecraft associated with analysis, and at least a conceptual understanding of the entire commercial process. Government analysts will not check someone else’s work, and may either discount it or discard it as part of their own analytic process. Integrating commercial insights into NGA or other U.S. government organizations will necessitate a significant level of trust in the analytic products coming out of the commercial sector. In order to ensure that the U.S. government can rely on its industry partners, a system will need to be developed to validate the quality of analysis being produced by the commercial sector. This system can be produced through a combination of U.S. government and industry best practices, and can be executed either within government or within the emerging GEOINT broker concept. Participating companies would need to be certified as trusted providers of imagery analysis, which would allow their processed data and insights to be seamlessly integrated into existing defense and intelligence systems. This system would include rules for certification and reevaluation, including those required by business model changes. Specific tradecraft standards would need to be developed and tailored to specific types of capabilities. For example, standards for synthetic aperture radar (SAR) would be different than those for standard multispectral imagery. Standards for night-time imagery (NTI) and non-Earth imagery (NEI) would likely be the most flexible due to the fledgling nature of those technologies and the limits on commercial resolution. Standards would need to be regularly updated to stay abreast of technological and regulatory developments. For commercial customers, analytic tradecraft and standards are equally important, albeit in different ways. Historically, the search for the “killer app” for commercial remote or anecdotal generalizations about why commercial clients might find value in these data and the insights they provide. Commercial customers of the imagery insights industry are already making key decisions using these analytic products, so they will need ways to maintain and increase confidence in how to use them. Selecting and satisfying specific market sectors, which we refer to as analytic verticals, remains tricky for the imagery insights industry. In order to drive commercial success, there has to be a sophisticated understanding of customer need throughout the value chain from sensed data to exploitation methods, to analytic tradecraft, to price and service models. There is the question of which data combinations – whether from remote sensing or elsewhere – will drive the highest potential commercial value. There may be tradeoffs associated with satisfying one vertical that might preclude satisfaction of another. 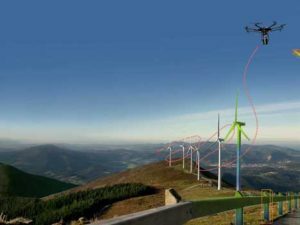 Other types of geospatial information, such as data from drones or terrestrial collection systems, serve both to complement and compete, depending on the business model. Which combinations will prevail? Understanding these issues will be an essential part of expanding this industry’s ultimate contribution to GaaS. It is in both the U.S. economic and national security interest to remain the international leader in commercial remote sensing and in imagery insights, both of which serve as foundational elements of GaaS. Beyond the CRS data providers, who are themselves reassessing their roles in this market, the imagery insights industry represents an important and growing segment of the commercial geospatial ecosystem. Addressing market opportunities in both government and a wide range of commercial applications will require experimentation and adaptation as clear value propositions emerge. There will be winners and losers. But careful attention to the analytic.